I work in a cube farm and we each have 2-3 fluorescent desk lights under our shelving. Most of us don’t use the extra lighting, but a few others like the extra light, especially if they do quite a bit of paper work (instead of computer work). However, I have a certain coworker near my cube who insists on leaving her desk lights on and gets mad if anyone turns them off overnight or over a long holiday. She tries to justify it by saying “my plants need the light”, but I’m sorry to say, the plants aren’t getting very much from this extra light compared to the amount of energy they’re using by being on so long, plus the damage to the environment when it’s time to trash the old bulbs when they die. What else does this coworker do? She doesn’t give a crap about recycling. There’s a mixed recycling bin about 10 steps from her cube that accepts paper, plastic, and cans, but she tosses everything into her own can, which, of course, goes straight to the dump, not to the recycler. So every so often, I turn off her lights, especially on Fridays and holidays, but I always hear her complain when she gets in, like it’s some horrendous event for her to turn on 3 switches. I hear her complaining about “someone keeps turning my lights off! Who would do such a thing???”. So this past Monday, I turned off her lights when she left, then on Tuesday she came in and complained as usual. I had my boss in my cube, so I called over that I turned them off because the university has a guideline to turn their lights off. She replied back, not knowing that our director was there, that “Bob (name changed) said she could keep them on for her plants”. My boss replied back that 1) Bob doesn’t work here anymore, 2) Bob didn’t pay the electric bills and 3) it’s university policy to turn off your desk lights when you leave. And just then, we all got an email from the university listserv reminding us to conserve energy by a number of ways, number one of which was to turn off your desk lights. SCORE! No, she won’t change. Why? In my opinion, she’s selfish and inconsiderate of others. There’s many other incidents that lead me to this conclusion that won’t fit in this post and probably shouldn’t be written anyway, but this coworker is just the type that cares only about herself. She thinks people are out to get her, that people are constantly stealing things from her desk…wait, is this Office Space? So what am I getting at? First, I wanted to complain anonymously about this coworker just to get it off my chest, but after a conversation with my wife tonight, we wonder if we’re in the vast minority. The minority being people who aren’t “Green Peacers”, but care about the environment. While we waste in some parts of our lives, we also go a little out of our ways to recycle or generally avoid waste in others. For instance, my wife goes through her office floor, turning off lights before she leaves. She also combines her trash can with the bigger, more used can so the cleaning people don’t waste a bag. She used a reusable mug rather than the paper cups in the kitchen. She uses water she doesn’t finish to water the office plants instead of just dumping it out (as do I). I didn’t grow up with a conscience about protecting the environment; rather, I think it’s the efficiency aspect I enjoy. I like to see ways I can save money or materials while still getting the job done, and that’s a trait I’ve adopted over the years. Another thing we do is compost food. We have a Soilsaver Compost Bin from Sam’s Club for about $40 (I’d link to Amazon, but they cost double) out in the yard. The hard part for most people, though, is what to do in the kitchen with the food waste. We have an old Country Crock container as a holding place for the food and we keep it in the fridge. When it’s full, we walk it out to the bin and dump it and start over. Not that hard, now is it? And this year, we got a wheelbarrow-full of nice black soil out of the bin from a year of composting yard and kitchen waste, which we used for our tomato plants (our first garden actually). What do you do in the office, or at home or at school? Do you just dump your bottle or paper in the trash, or do you search out a recycling bin? Do you take your recyclables home if your workplace doesn’t recycle or is that too bothersome? Do you recycle and conserve out of concern for the planet’s future, or out of efficiency? I said to myself, “Me too!” I often feel like since I’m not a complete environmental hippy, but also not an indiscriminate resource waster either, where do I fit in? I’m quite impressed you did that. I wish there were more people like you. I will go around and turn off people’s lights sometimes at the workplace too and I get the same reaction as you did. It gets on my nerves wasting our world’s resources. My wife will reuse water and not dump it too so she rubbed off on me because I realized that I was dumping water too and decided it’s best to use it or drink it. I make it a point to turn off the lights in the printer room, and the lunch room, and the washroom when I’m leaving them (if nobody else is there, of course). Really, if it’s dark, just turn them back on. I mean, if you’re home and leave a room, you turn the lights off, don’t you – why wouldn’t you do the same thing at the office. Interestingly, turning the bathroom lights off has caught on, and almost everyone does it now; but not so much the lunch room or the printer room. I am kind of in the middle. It makes no sense to me to turn off a supply room (any small room) light when there are thousands of other lights already on throughout the corporation and remain on throughout the corporation. It is just insignificant one little light vs thousands of lights. Yet the bathroom lights remain on nothing said. It doesn’t save anything as during the course of the day this one little light will be turned and off. You won’t convince me that that one light will save anything, maybe 1/1000th of a penny a year. I don’t buy “every little bit helps”, it’s one light bulb which isn’t going to change someone’s habit. On the other hand I lean toward being a minimalist. The environmental aspect is just an extra benefit. I use much less than most others I see using. I don’t have my desks (Yes I have two desks) cluttered with papers. I don’t like paper clutter. I do put papers in the shredder as it is recycled. If recycling is just as easy as throwing it in the garbage, I recycle. If not, I do not recycle. At previous employers, we would have 2 bins at our desks – one each of recycling and garbage. I would always recycle my soda cans…but my current employer does not provide recycle bins at each desk, so I toss it in the garbage. What it all comes down to is this – if I do not have an incentive to recycle, then why should I? The greater good of society in general is not a strong enough incentive. On another note, I am insanely environmentally friendly in other areas of my life by conserving water and energy at home (because I pay the utility bills). When I was a kid, I did an experiment testing the benefits of different lights on plants. I remember that the effect of fluorescent lights on growing plants was so minimal that it was really just a step up from no light at all. Of course this was the experiment of a mad 7 year old scientist, so it could have been entirely botched. I never thought about how co-workers treat their own area. I just thought it was common sense to turn lights off when you’re done with a space and to recycle what you do not use. Seems like common sense, but I guess not everyone behaves that way. We are not asking people to go that much out of their way. I wonder if she leaves the lights on all night and day at home? Good for you. You made your point, and you did it tastefully. Hopefully your co-worker will get the message. Personally, I do my best to “go green” at work, home wherever. Its frustrating when we’re on vacation and the place does not have a recycling bin. I think that people who react in that way are not really reacting at all to the “green” or not “green” issue. I think that they feel controlled by many of the forces around them that are chosen for them instead of it being their own choice. I would bet that this person is in a subordinate position and is not a decision maker. Which also means many other things are dictated to her. Perhaps a dress code, or times to work or where you sit. Fill in the blank. My opinion is that it is great that you take positive steps, and you really should focus on your own efforts. If this is the tone you’re going to take, I am more of a mind that you should mind your own business. all the lights in the my office are motion sensitive. so they turn off themselves after 5 minutes. it is all about money and being efficient. I have to say that waiting until you boss was in your cube unbeknownst to her was a shady move at best. I can appreciate your position on her lights but why not just tell her yourself without the boss there to support you? 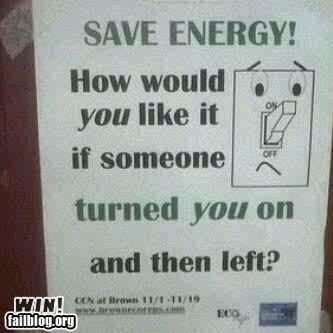 Why not just tell her person to person that you have been and will be turning her lights off? Does this woman intimidate you? Or tell her with the boss there but be upfront and let her know the boss is there. I get the feeling that there are other issues with this co-worker and that often happens in the office politics but I definitely think it’s a foul to lure her into a confrontation when she doesn’t know the boss is there. I’d keep your head up. You probably have a co-worker looking to pay you back on that one. @Dave, sorry I wasn’t clear when I wrote the article that my boss happened to be in my cube talking about something else when the other coworker came in and immediately started trash-talking “the person who keeps turning off her lights”. There was no intent of confrontation with my boss; he just happened to be there and witness to it and he voiced his opinion from a managerial perspective. I worked in an office withover 1000 once. They used styrofoam cups for the hot drink machine. I made it public as i could that his was wrong. I fought with management to get this changed for a year. Finally they gave everyone a mug for Christmas. Problem? The mugs were cheap and smelled like plastic. They didnt keep liquids warm and they broke down. Yikes! So everyone just kept on using plastic. It made me so livid. A small change for them. A big change for the environment. I had worked there years before and had convinced them to recycle. I was hoping this would work but it failed. I’m glad I dont work there anymore.